"Om Shanti (peace)." That's how members of the sister spiritual organisations -- Brahma Kumaris and World Renewal Spiritual Trust (wrst) -- greet you. And here's why we went visiting them: "We have extended our pursuit of inner purity to adopt purer forms of energy; renewables like solar and wind energy," says Golo Pilz, adviser to the two organisations. Already, Brahma Kumari centres spread across the country utilise solar and wind energy for cooking, lighting and electrification. With the setting up of a department of renewable energy in 1993 at their headquarters in Mt Abu, Rajasthan, the Brahma Kumaris and wrst were on their way to a significant shift to renewables. In 1994, the German government sponsored the setting up of a 300-watt wind generator and an 800-watt solar generator at Mt Abu. The electricity generated was used for basic purposes like lighting. 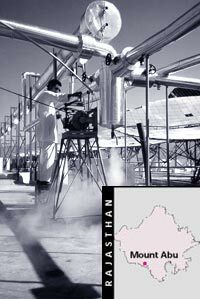 In 1997, the first solar steam cooking system started functioning at Mt Abu. Finances for the approximately Rs 25 lakh project came from the German Society for Technological Cooperation (gtz; Deutsche Gesellschaft fr Technische Zusammenarbeit). The solar steam cooking system uses parabolic concentrators (mirrors), which concentrate solar heat and generate steam. The 24 parabolic concentrators are fixed in rows, and concentrate heat energy on a certain area. Temperatures at the concentration point touch 350C-500C. Heat converts water into steam, which is used for cooking. The water that cools down is reused to make steam, and the cycle continues. There is a provision for an alternate diesel boiler system on cloudy days. "The system is capable of handling cooking load for about a 1,000 people at one time. We usually prepare meals twice a day, and tea once a day," saysB K Suresh, who works in the solar department of the ashram. From 1997 on there was no looking back. "In 1997-98, the Brahma Kumaris installed 100 solar pumping systems at Mt Abu and the Abu Road complex, with finances in the form of soft loans from the World Bank," reveals Pilz. Though there were some teething problems, they were later sorted out and are working fine now, he adds. In 1998, the Brahma Kumaris set up a solar steam cooking system on an even larger scale at the Shantivan complex, Abu Road. The system could handle cooking for up to 35,000 people. This project was an improvement on the Mt Abu system, both in terms of technology and output. "The project cost about Rs 60 lakh, and the ministry for non-conventional energy sources (mnes) partially funded the project," says Pilz. mnes contributedRs 10 lakh to the project. The Abu Road solar steam cooking system has 84 mirrors and generates steam directly into the receivers. The system generates about 3,500 kg steam per day. It is one of the largest solar steam cooking systems today. Two more steam cooking systems were set up: one at Yellupur (Hubli, Karnataka) to cook for 600 people; and at the Om Shanti Retreat Centre, near Manesar, Haryana, to cook for 2,000 people. "We are saving up to 300 litres of diesel and 1.2 tonnes of carbon dioxide emissions a day," Pilz asserts. Brahma Kumaris tried to extend the renewable experience to villages located near their centres. Under a rural demonstration scheme funded by mnes, Salgaon village near Mt Abu was provided with solar street lighting systems, solar pumping, solar lanterns and solar cooking boxes. However, this was not always an easy task. Pilz says that local maintenance is something of a hurdle. He suggests that villagers should pay at least some token money, so that they have a sense of ownership and make an effort to maintain the equipment. The Brahma Kumaris and wrst have set up a shop to market solar energy-based products. They have supplied 15,000 solar lanterns, 500 home lighting systems and 400 solar cooking boxes. The products are subsidised by mnes and the price varies based on equipment cost. Sixty centres of the two organisations have been equipped with 5-kilowatt solar photovoltaic systems. The World Bank provided soft loans for the project, which were channelled through the Indian Renewable Energy Development Agency. The latest Brahama Kumari-wrst plan is to set up a solar steam generation unit at their Global Hospital and Research Centre at Mt Abu. The project is under mnes consideration for co-funding. "We are probably the single-largest organisation utilising solar renewable energy," says an evidently satisfied Pilz.